Just the sight of medieval tabards makes you think about the iconic imagery of the medieval period in history. Tabards are coats that are usually knee-length and feature decorative and eye-catching designs and insignia. 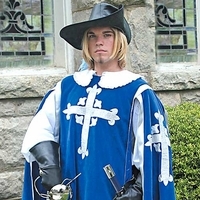 While they are an extremely popular accessory for LARP and Renaissance Faire enthusiasts, they are actually some of the least understood articles of medieval clothing. At Pearson’s Renaissance Shoppe, not only do we have a full selection of tabards for sale, we also serve as a resource for information on these unique pieces of medieval dress. We did our research when creating our tabards for sale in order to give you authentic-looking tabards. Tabards, as we know them today, grew from simple outer garments worn by peasants, monks, and foot soldiers. These tunic-style tabards were thin and sleeveless. By the 15th century, the tabard evolved from the modest tunic to the garment we know today. This new style of tabards featured open sides (like a shawl) and a belt in order to secure it to the body. The tabard was adopted by knights who would wear them over their armor, and would often feature their arms embellished on the front. This was not the end of the evolution of the tabard. Over time, the tabard grew to be made of 4 panels of fabric. These panels consisted of two large panels that draped over the front and back of the wearer and two smaller pieces that hung over the arms as short sleeves. One of the main reasons tabards remained popular throughout the medieval period, other than their practicality, was that they were an easy way to identify fellow soldiers on the battlefield. Although tabards have fallen out of fashion, they are still immensely popular for those who enjoy LARPing and attending Renaissance Faire. Their popularity endures with them because of their comfort, versatility, and iconic look. Our tabards for sale feature authentic insignia based on the designs featured on real tabards of the medieval era. Take a look today at our selection today at Pearson’s Renaissance Shoppe and give your medieval costume an added layer of authenticity!